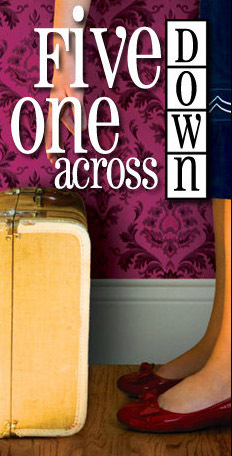 Boston Playwrights’ Theatre starts its 2010-2011 season close to home with "Five Down, One Across," a comedy by recent Boston Playwrights’ Theatre alum Michael Towers. In "Five Down, One Across," Betty relocates her 85-year-old mother to her not-so-ordinary Brookline home, however, she’s got to tell the truth about her failed marriage, her mysterious pet, her prestigious career and her sixteen-year relationship with her “roommate” Sharon. Directed by Sidney Friedman and featuring Alice Duffy and Chloe Leamon, this is a serio-comic look at “coming out” in more ways than one. Performance dates are September 30 - October 24 at Boston Playwrights’ Theatre, 949 Commonwealth Avenue. Boston Playwrights’ Theatre then flies to the Indian subcontinent in "Two Wives in India" by Boston Playwrights’ Theatre alumna Leslie Harrell Dillen. Becca and Mary Jo arrive in Delhi for the marriage of Emily, their daughter and stepdaughter respectively. Becca and Mary Jo may have had the same husband, but they share little else in common. Emily’s marriage to Jaskanvar puts an emotional strain on the two women as they deal with culture shock and the death of Emily’s father Sam. Directed by M. Bevin O’Gara and featuring Karen MacDonald, "Two Wives in India" asks when should we hold on and when should we let go. Performance dates are October 28 -November 21 at Boston Playwrights’ Theatre, 949 Commonwealth Avenue. Then it’s off to Swansea, Wales, as Boston Playwrights’ Theatre and Boston Children’s Theatre once again present "Dylan Thomas’ A Children’s Christmas in Wales," adapted by Burgess Clark. As seen through the eyes of a young Dylan Thomas, this second annual production retains the wonder and charm of last winter’s performances with Christmas carols, presents, odd relatives, and yes, freshly fallen snow. Originally commissioned and performed by the National Theatre of the Deaf, Clark’s adaptation stays true to the best of Thomas’ vision, all the while leading to new wonderments. Performance dates are December 1 -December 30 at Boston Center for the Arts, 539 Tremont Street. The globetrotting continues with "Walking The Volcano" by Jon Lipsky -- a collaboration between Boston Playwrights’ Theatre and the Boston Center for American Performance. "Walking the Volcano" showcases a series of short vignettes exploring intense love relationships, ranging from a meeting in an airplane bathroom over the Pacific to a tryst in a seedy room in Saigon during the Tet Offensive. Lipsky’s characters are nothing if not complex, compelling, vindictive -- and in a search of truth. Performance dates are April 14 -May 1 at Boston Playwrights’ Theatre, 949 Commonwealth Avenue.